...where board games are your Friday nights out. All of your favorite board games, rules and more! Spinning your saucer fast enough to lift and transport your fuel balls from the launch pad to the Mother Ship is your goal in the game Space Spinners. If you can get rid of all your fuel balls first then you'll win. Beware, this is not as easy as if might seem which makes this game a blast (pun intended) for kids and adults alike. Space Spinners is a very hands on, fast paced game. No boring cards of dice involved. Just a rocket ship and fuel balls. 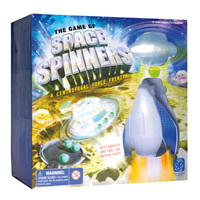 Loved by children six and older, Space Spinners will take your game night or space party to the next level, or should we say, to higher heights. Grab this game today! To win, you must be the first player to spin all of your fuel balls into the Mother Ship. You get a mother ship, 4 landing pads, 4 spinner ships, 24 fuel balls and the official Space Spinners game rules and instructions with this game. Please keep in mind that the official Space Spinners childrens rules and instructions could be different depending on the game version you have. The rules below are some of the exact directions on how to play Space Spinners. Share with us your comments, funny stories, tips, advice, strategies, creative ways to play, questions about how to play, problems with the rules or anything you want about Space Spinners. All submissions will be reviewed within 24 hours. Click here to add your Space Spinners comments. This is exactly what I was looking for. We have a space party for my son in a couple weeks and I needed some kind of game to keep the kids entertained. Thanks for posting this.